Jorge Posada is not normally the first name that comes to mind when thinking of the top players from the New York Yankees. The catcher spent his entire 17-year MLB career with the team after being drafted by the club in 1990. Despite being one of the greatest backstops to ever put on the iconic pinstripes, Posada was overshadowed by high-profile teammates like Derek Jeter and Alex Rodriguez. In spite of this, his offensive production makes him a borderline Hall of Fame candidate. Posada amassed five All-Star appearances, four World Series Championships and five Silver Slugger Awards as the top catcher in the American League. Although not on the same level as Jeter or Rodriguez, Jorge Posada cards remain popular today. Shop for Jorge Posada cards and memorabilia on Amazon. Catchers are not normally high on the list for collectors as their hobby love is sometimes limited by a perceived stigma of being role players. Posada was able to overcome this with his strong hitting and his connection to the most recent Yankees dynasty. Although Posada has good name recognition, he has been on the downward slope of his career for several years and his values are unlikely to see much in the way of increases. At this point, it is hard to recommend Posada as a great investment opportunity. Given his retirement, values have likely peaked for now. The one possible big jolt for Jorge Posada cards and memorabilia would be a Hall of Fame induction into Cooperstown. Only time will tell if that can happen, although he should be considered a long-shot. However, Posada's team loyalty and clutch hitting has earned him a reserved spot of honor with the Yankees and their collectors for years to come. 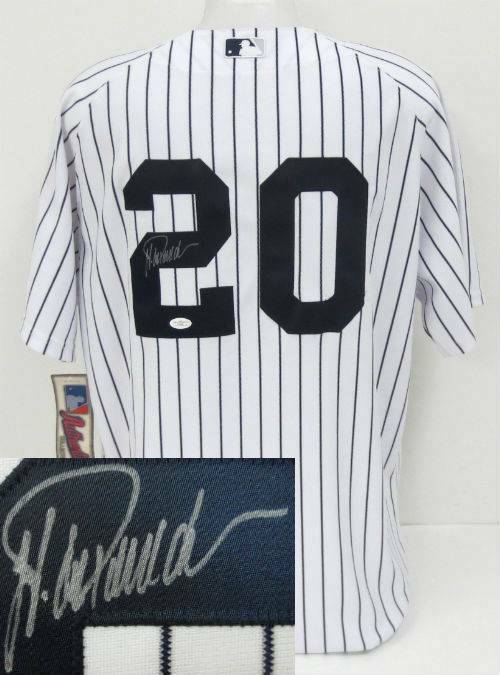 Given his high-profile role on the Yankees, Posada autographs are relatively few. As a result, collectors should expect to pay a bit of a premium versus comparable players. 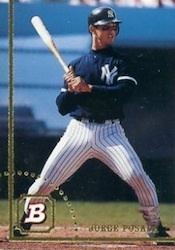 There are two Jorge Posada cards from 1994 Bowman products that make up the Yankee standout's rookie checklist. Both cards are easy to find at reasonable prices. 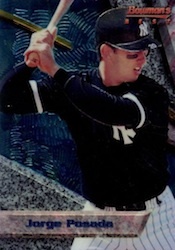 Posada's 1994 Bowman's Best rookie card represents the top-draw for collectors as well as the best option from a relatively weak 1994 rookie class. The card's heavy use of marble and granite in the design feel extremely dated. It also has a bizarre color scheme. It is remarkable how little Posada's appearance changed from 1994 to 2012. 1994 Bowman is the only other product with a rookie card of the catcher. Although slightly less valuable, it's the better looking of the two Jorge Posada cards. Rather than focusing heavily on design like the Bowman's Best card, 1994 Bowman makes use of a complete image and some subtle gold foil. 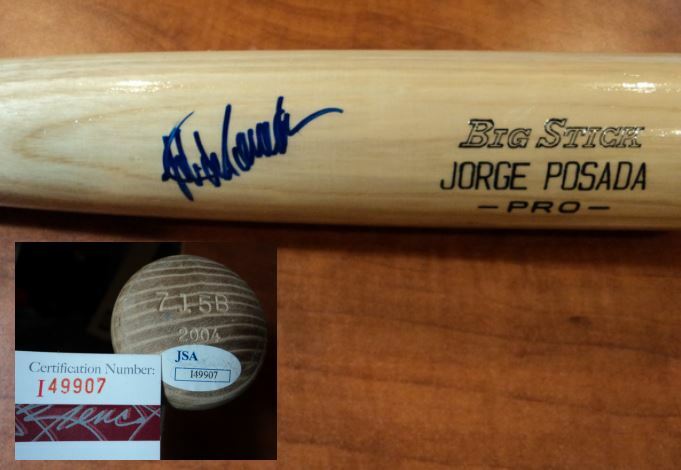 Below you will find an example of what Jorge Posada 's authentic signature looks like. This can be used as a first point of reference for determining the legitimacy of autograph memorabilia, but is not a substitute for having your items authenticated by a well-respected professional autograph authentication company. Some of the trusted sources within the sports memorabilia market include the following companies: PSA, JSA, Steiner, Tristar and Sports Card Guaranty. Click on any of the images below to view full size photos. 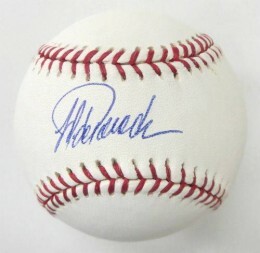 Signature is truly unique, written in cursive script, with few letters discernible. The signature starts with what looks like a capital letter "H" that starts with a small curlycue and contains two parallel lines with narrow loop. A swooping character resembling a guitar pick defines the signature. 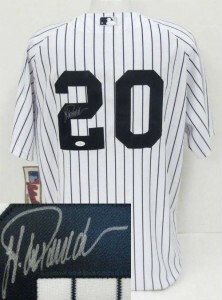 This swoop comes off of what looks like a lower case "d."
This is followed by what looks like "i-e-w-d-c."
Autographed Official Major League Baseball Signed by Jorge Posada, GAI, COA. Jorge Posada "New York Yankees" Signed 8x10 Glossy MLB Baseball Photo GAI Auth.